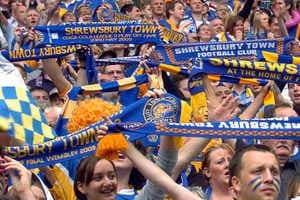 Shrewsbury versus Walsall is not one of the most famous and revered derbies in English football but supporters of the two teams hate each other’s guts and the latest clash of the midlands minnows has all the makings of a low-scoring game. Walsall entertained Shrewsbury in the English FA Cup first round last month and made it through to the next phase by winning 3-0. However, Shrewsbury’s performance was so poor that it normally mild-mannered manager, Graham Turner, went ballistic during his post-match media conference and Walsall boss Dean Smith admitted that the Saddlers have caught the Shrews on one of their off days. It is very unlikely that Walsall will be as dominant in the rematch away from home. The attractiveness of betting on under two and a half goals between Shrewsbury and Walsall at the Greenhous Meadow at odds of 1.78 with BetVictor is high because of numerous statistics. Browse the English League One over/under chart and one has to scroll down to the bottom to find Shrewsbury and Walsall. Shrewsbury’s 19 English League One games have averaged 2.26 goals and 12 of them have gone under two and a half goals. And even better than that, Walsall’s 19 English League One matches have averaged 2.00 goals and 14 of them have gone under two and a half goals. Finally, Shrewsbury’s 10 English League One home games have averaged 1.90 goals and Walsall’s 10 English League One away matches have averaged 1.70 goals. BetVictor is going to do business. Staying in English League One and championship favourite Wolverhampton is well over the odds at 1.80 with BetVictor, to defeat badly out of form Milton Keynes at Molineux. Wolverhampton is not the English League One title certainty that bookmakers and Wolves fans think but it is in much better shape to get out of England’s third tier than Milton Keynes, which is experiencing its roughest trot under young manager Karl Robinson. Milton Keynes has lost each of its last three English League One games and five of its last six in the competition to slide to 12th on the ladder, nine points outside the play-offs. Furthermore, Milton Keynes has lost six consecutive away matches across all competitions, with four of those games against teams ranked below it. A speculative English League One punt concerns the match between Brentford and Oldham at Griffin Park. Brentford and Oldham are two of English League One’s form teams, with the Bees collecting 16 points from their last six games and the Latics accruing 14 points over the same period. However, Brentford is reeling from the loss of its boss, Uwe Rosler, who has joined English FA Cup holder Wigan. Brentford bowed out of the English FA Cup away to Carlisle just hours after Rosler pulled the pin and it is anyone’s guess as to the state of mind of many Bees players. After all, many of them joined Brentford because of Rosler’s vision for the club. There are a number of ways to attack Brentford versus Oldham from a betting perspective. One could back Oldham to win at odds of 4.75 with BetVictor. One could back Oldham on the draw-no-bet market at odds of 3.40 with BetVictor. Or one could back Oldham at odds of 2.05 with Bet365 not to lose. If one had to choose one of the plays, backing Oldham at odds of 2.05 to get something from the match would be it. Finally, a side is likely to pay for Juventus bowing out of the UEFA Champions League and that side is likely to be Sassuolo. Juventus leads Italian Serie A by three points after 15 rounds, with its home record being a perfect seven wins from seven games, including four clean sheets and three victories by three or more goals. Even though Sassuolo is doing better than expected in Italy’s top flight it is just 17th out of 20 and it has the second worst goal difference in the division. Juventus is available at odds of 1.87 with BetVictor to beat Sassuolo to nil and the most reluctant of UEFA Europa League participants is trading at odds of 2.45 with the same bookmaker to cover a two-goal handicap line.